Many a times, I have received requests from my colleagues or friends on what certification to begin with and what certification to write next. After passing 18 Salesforce certifications, I have planned to share my thoughts on the certification path but with preparation time saving with proper direction. The path will vary from person to person and the roles people are playing at their organization. Since ultimate goal is to reach highest level of certification i.e. 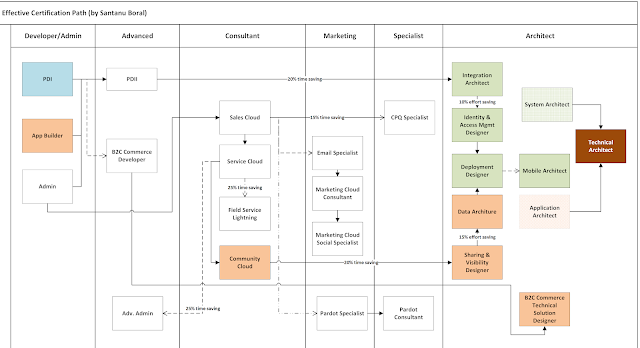 Technical Architect, so how a Developer or Administrator could reach that target, I am trying to portray. Also, I have posted the same in twitter and received numerous likes and retweets. Hope people thought about its usefulness. All orange boxes are part of Application Architect certification. PDI is blue box which is pre-requisite for both Application and System Architect certifications. Solid arrow is most preferable to go next. For example, if a developer wants to go for architect related certification then better to complete PDII which will help for his developer role and after that choose Integration Architect certification. Here the some part of integration related study materials can be reused, specially use of SOAP API, REST API related topics. So around 20% effort saving during preparation. You can say less reading or revision. Second scenario, if an Administrator wants target for Architect level exams then go for some Consultant level exams and then appear for Sharing & Visibility exam. Since Sharing and visibility topics are quite common for all Consultant level exams so there could be 20% effort saving considering that path. Hope it will help our community members to reach their own destination. Again, this path will vary based on own target and it is not universal to be followed but it is indicative one.